And now this is ricocheting through the industry. Monday after hours, the largest US truckload carrier, Swift, announced earnings. And on Tuesday, it clarified the debacle. It’s suffering from indigestion. The high costs from its red-hot capacity increase – average truck count jumped by 831 trucks in the third quarter from a year earlier – are now slamming into swooning freight demand. Operating revenue declined 1%, which Swift blamed on the disappearing fuel surcharge, though it didn’t explain why it is getting away with still charging $109 million in fuel surcharges when diesel prices have plunged to rock-bottom. So it’s cutting back. In its previous disclosure, it announced that its average truck count for 2015 would grow by 700-1,100 trucks. Now it cut the growth down to 500-600 trucks, “given that the freight environment is softer than we originally expected, and peak volumes have not yet materialized as in years past,” it said. September is the beginning of the holiday shipping season. Volume should be sharply higher. 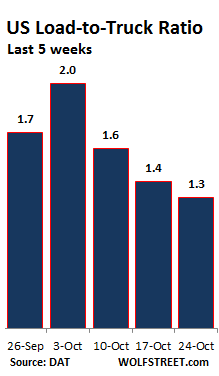 But it’s not happening [read… US Freight Shipments Have Worst September since 2010]. Now it’s down to cost cutting and focusing on “improved utilization” of the fleet. So it lowered its outlook for 2015 earnings, “in light of the items discussed” on September 25, 2015, which is when it had issued its original earnings warning. Its shares have plummeted nearly 50% from their 52-week high in December. “Effective immediately we will enter into a zero fleet growth mode,” Swift CEO Jerry Moyes told analysts. The company “will not be adding any new equipment,” he said, and is considering actually reducing its truck count. It blamed Brazil and China. In the US, demand for heavy-duty truck engines had been strong, and orders were expected to reach a decade high, as Swift and others had been ordering trucks from truck makers, and they’d been ordering engines from engine makers such as Cummins. But then the third quarter came around; suddenly Cummins’ sales of heavy-duty truck engines fell 9% year-over-year, and orders plunged. “It’s evident now that retail sales [of trucks] and production will be down going forward,” explained COO Rich Freeland. Cummins shares, which plunged 8.7% on Tuesday, are down 32.5% from their 52-week high in December. In this scenario of overcapacity and slack demand, the critical load-to-truck ratio has collapsed to the lowest level in years. 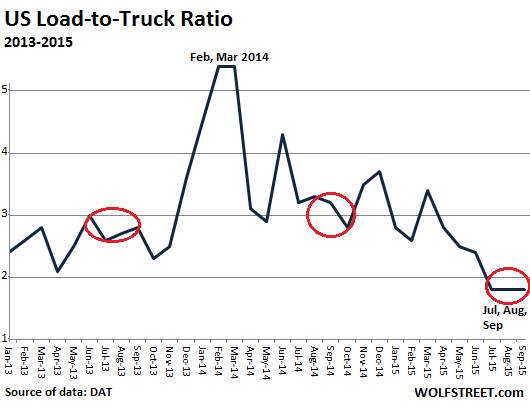 The hump in the chart above in February and March 2014 was caused by the tough winter, which “squeezed truckload capacity in the northern band of U.S. states, and load-to-truck ratios spiked.” This caused an immediate increase in spot market rates, and by April, contract rates began to rise. But by December 2014, the party was over. Spot market rates began to fall. Contract rates eventually followed. This is just like my years in Japan. Half the people think we’re heading into a recession, the other half think we never got out of one. Another turn of the screw on what’s left of the middle class. Good thing that this is the year of the long heralded economic “lift off”. Better be quick though, we are running out of year. No worries, if they can print money, they can print years. Every day, the financial world reminds me a little bit more of a Magritte painting . Is cargo already moving from west coast to eat coast and gulf ports ? Actually, railroads are confessing to a slowdown in shipments of all kinds – they’re blaming oil, coal, and other commodities, AND for intermodal, the low price of diesel that makes trucking more competitive. You couldn’t be more right brother. I’m a container driver O/O and we are getting our asses handed to us. Horrible times right now. Blaming China? LOL, they should have checked how Apple’s revenue has shot up by 99% in China. Until that rolls over, no recession yet. As a worker in the retail industry, this is disheartening, yet expected, news. Sales are crawling. And while the subsequent question is off topic, as a worker that services retail drug stores, can someone explain why shares of Walgreens and Rite Aid got clobbered today after the announcement that Walgreens would purchase Rite Aid for more than $9 billion and that Walgreens had finally turned a profit last quarter? Even though they don’t pay me to do so, just wondering. I suspect the search light being suddenly turned on the whole pharma-complex might be the answer. It all began when that loathsome twerp figured he could raise the price of a 60 year old cancer drug by 5000 %-from a few bucks a pill to hundreds. He was a minnow but he pulled the search light onto Valeant, until last month the most valuable company in Canada. Valeant was far more reasonable than buddy- when they acquired a maker ( pretty much their business model) they would never be so nasty as to raise the price that much. A mere 300 % was more their speed- just enough to wet their beak. The have also been accused (not legally so far) of squeezing pharmacies they own to dispense more expensive drugs than necessary. Then Hillary Clinton focused on Valeant- and the pharma- complex in general. Subpoenas have been issued to Valeant. As for buddy who began this- if big Pharma had known this was going to happen, I doubt he would be with us. Valeant has taken a multi- billion dollar hit- stock price cut in half. If I was him I’d bury some gold, announce that I’d found Jesus and donate the drug. Recession is when you wait for next job openings; Depression is when there is one job opening and you are one of the tens of thousands who applied for and did not fill it. The non economic depression is when you finally admit you are a fn failure and go sit on street corner begging, only to be kicked in teeth by police and told to move on. Again, the signs of recession are all around us from shipping containers to trucks to rail but the stock market is on a tear upwards.. It seems/feels like I am living in an alternative universe where up is down and right is liberal..
Is this another early warning of Deflation in America? Welcome to my world, ladies and gentlemen. Been feeling this for a while. Went down to load at the Port of Baltimore and it was dead, dead, dead. It was like cheating compared to some of the past adventures I’ve had there. Supposed to be a spike in diesel prices tomorrow so the company had us all tank up tonight and ignore the ‘fuel solution’ function of our pointy headed computer. Also the company has dropped the requirement of having a hazmat endorsement on the CDL. I suppose it has something to do with liability issues but that’s simply a guess on my part. I’m working straight through til Xmas vacation to make hay while the sun shines as I expect January to be as dead as Caesar. Julian, I was hoping you would comment on this. Good to hear from people with first hand experience on the issues discussed here. Good luck to you and be safe out there.